Now like another product that I have used and raved about, the Beardster Chai Lemon Beard Butter is a little heavier than most butters. This is something that I really like as it keeps my beard looking good. Couple that with the Chai Lemon scent and I have no doubt that it deserves one of these! But why the Golden Beard Award? Let’s start with the ingredients – Mango Butter, Shea Butter, Avocado Butter, Aloe Vera Butter, Rice Bran Oil & Coconut Oil and I always favour beard care that is made from all natural ingredients. 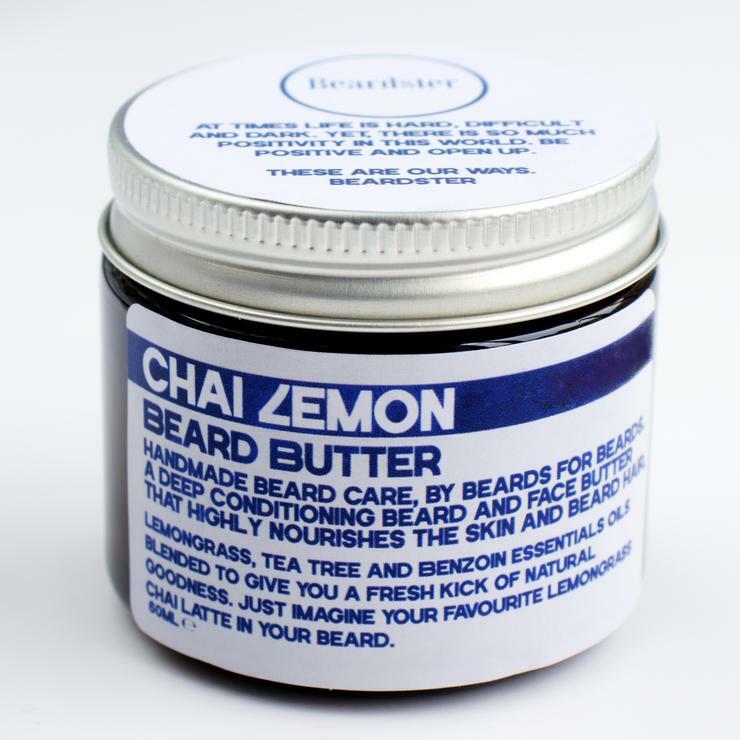 Then there is the fact that the Beardster Chai Lemon Beard Butter left my beard feeling soft and looking good, the consistency is as I said slightly heavier and gives a nice hold to my wirey scruffy beard and I was very happy with the way my beard looked whilst using this product. The scent is very nice, a blend of Styrax benzoin Gum Oil that is sweet and slightly balsamic, Tea Tree and Lemongrass. Beardster have really hit a home run with this scent! Of course the fact that it is £10 for 60ml also makes this a product that has to be tried, that is a very reasonable price for a small batch and all natural beard care product. Finally the fact that the Beardster products have been assessed and approved for sale in the EU. The Beardster Chai Lemon Beard Butter comes in a 60ml glass jar with screw top lid and costs as I said a very reasonable £10 from the website. It is also available in Unscented. You can also keep up to date with Beardster on Facebook, Twitter, Pinterest, Instagram& YouTube. The Beard Care Company for the Beardster. The guy who cares about how he looks and is motivated to go get stuff done. It is 2014 and I, Daniel, had been exploring growing a beard for a while. I had kept the beard short, trimmed and sharp. A style that is minimalist and one that I still love. The problem I had was itch. My face was itching all over and my skin was flaking and falling off. It looked gross and felt horrible. So I looked for some products and came across Argan oil and Coconut Oil. At this point I just chucked these on my face and they did a good job. I looked for some curated products but all I found was heavily perfumed scents that irritated my face. So I began making my own products. Beardster as a community started in May 2017 when we started our Instagram page, documenting a new beard Journey and featuring fellow Beardsters to showcase their efforts. In November 2017 we launched our YouTube channel and post weekly tips and lifestyle videos to help you improve. In February 2018 we launched our handmade natural Beard Oils. We have a lot more we are going to be doing though. We had been asked about supplying the products I was using on a daily basis whilst documenting my beard growth. So it made sense to provide these to you at the lowest cost possible whilst retaining ethically sourced ingredients of the highest quality. We know there are plenty of Beard Care companies out there selling their handmade products or mass produced products. Kudos to them. We want to do things differently though. We want to be the Beard Care media company that provides you with the very best information and lifestyle tips each week. We also want to continually innovate on products. So going forward, we will document all our ingredients, we will inform you why they are used, where the ingredients are sourced from and we will continuously innovate our products. We look at the Female Beauty Industry for a lot of inspiration. We love how those products can make a person feel so much better about themselves. We are going to do this for you.